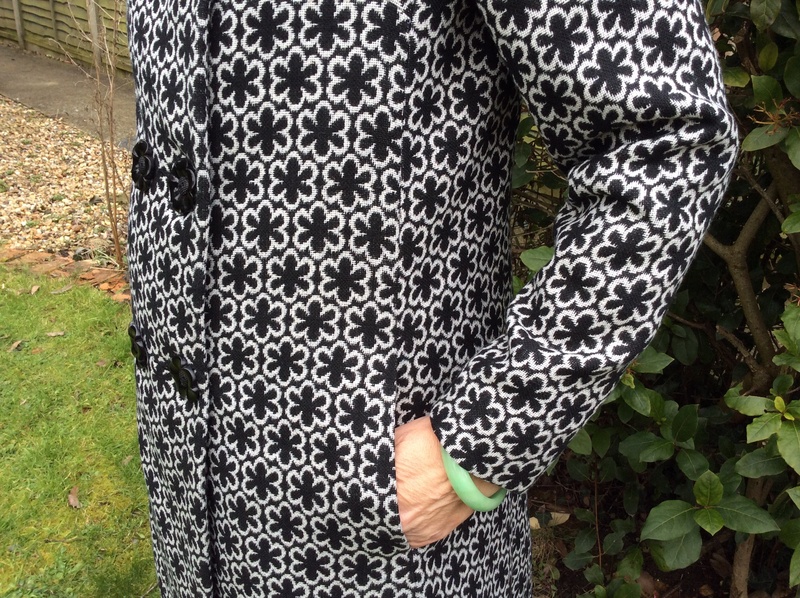 I am SO pleased to say that I have FINALLY finished my coat and here it is! It has taken four weeks of a weekly workshop at Sew Over It, Clapham with the super talented, super patient Julie and four weekends of homework (which has been substantial). I have blogged each week charting my different feelings towards the project which have veered from extreme frustration and desperation through to pleasure and wonderment. If you are new to my blog and are interested in its journey (someone might be – certainly no-one in my household is) then you can read about it here: week one; week two; week three; week four. I think it is only fair I give huge credit to Julie who held my hand throughout the process. I found the number of pattern pieces overwhelming: lining, interlining and shell. The lined pockets incorporated into the seam took me one whole workshop of three hours. I don’t drive; I don’t have any spatial awareness. Similar deficiencies became apparent during sewing – I find construction really quite baffling and when some particular aspect finally comes together, it seems to me to be as if by magic. 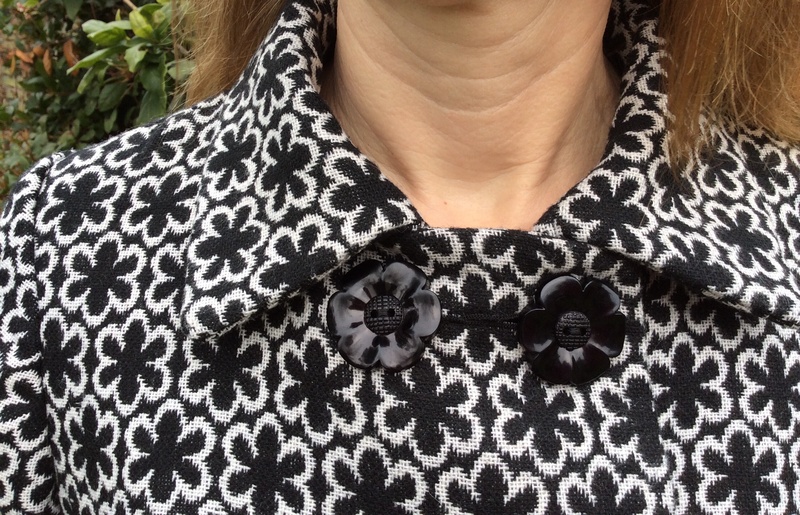 I was also lucky enough to meet David Miller of DM Buttons in Soho who expertly made my buttonholes and the funky buttons came from Ditto Fabrics in Brighton – I was really lucky to get some which managed to perfectly match the flower design of the coat. The fabric came from Guthrie and Ghani who also supplied the lining. I would highly recommend Lauren’s store for online purchases. She was extremely helpful, sending swatches and confirming that the fabric would be suitable for the coat I was going to make. Items purchased always arrive swiftly and are beautifully packaged. Ooh dear – this could be beginning to sound like an Oscar Acceptance speech – so after, Julie, David and Lauren there was me! 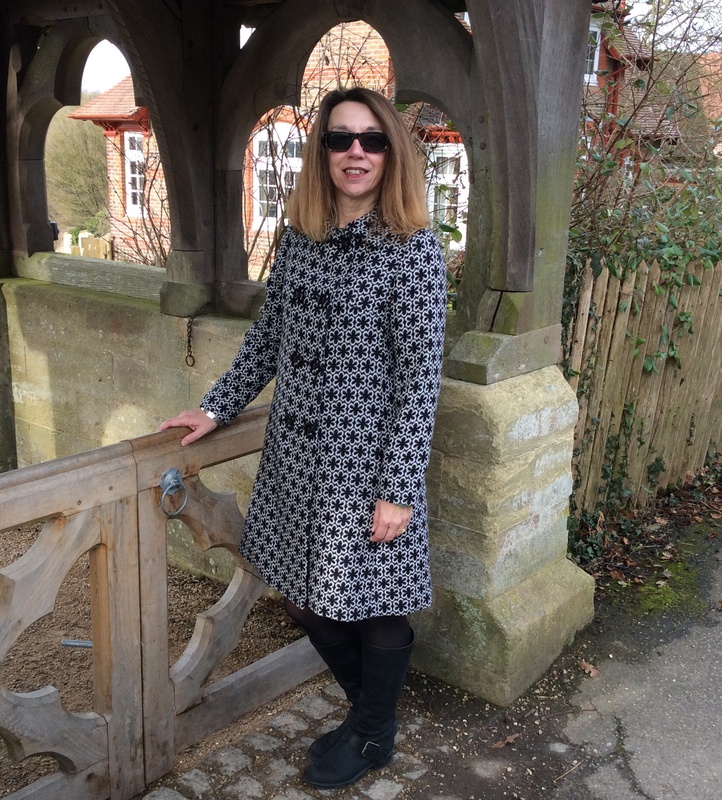 Regular readers will know how I frequently feel deflated and am quick to point out errors but I really am chuffed to bits with my coat – it is certainly my most ambitious make to date – and probably a feat never to be attempted again! In order to consolidate my learning (SUCH a teacher), I really should go straight into another one – perhaps in a cotton twill or canvas for summer. I know this would be the best way to ensure I do not forget all of the techniques I learned but I am not sure I have the motivation to keep going by myself. Knowing I had to face Julie and my fellow workshop chums each week meant I tried hard to do all of my homework and keep more or less on track. So there you go, the journey of my 1960s coat has finally reached its destination. 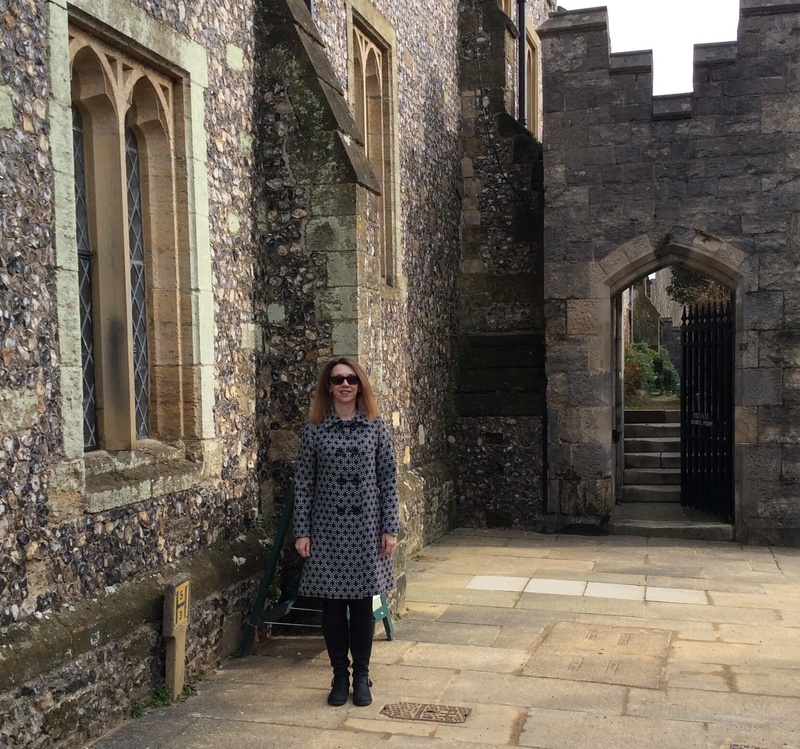 The photos were taken in Arundel this morning on a cold but bright sunny day and the coat kept me warm. 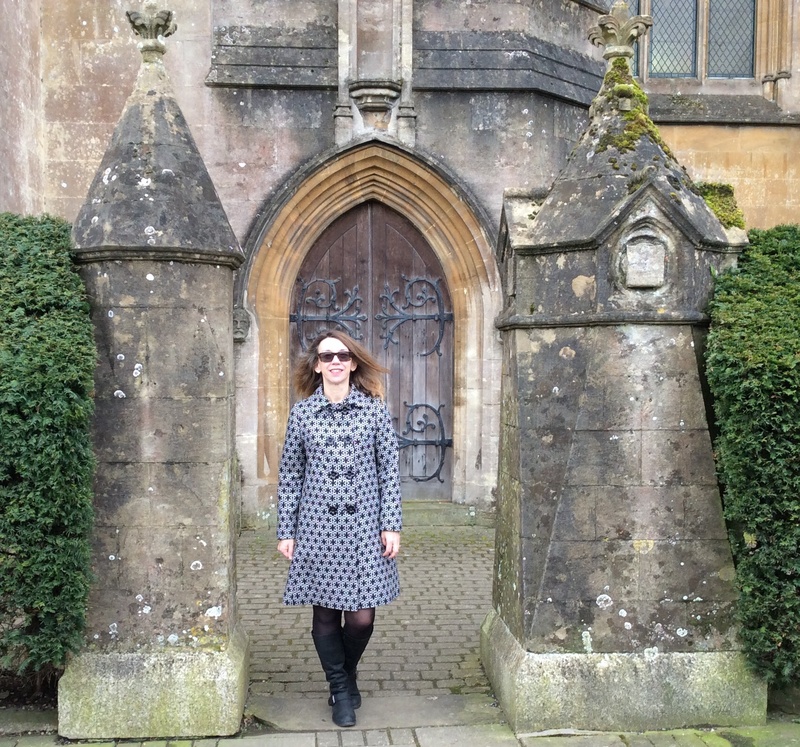 One final comment – a question actually: I have three weddings to go to this year. 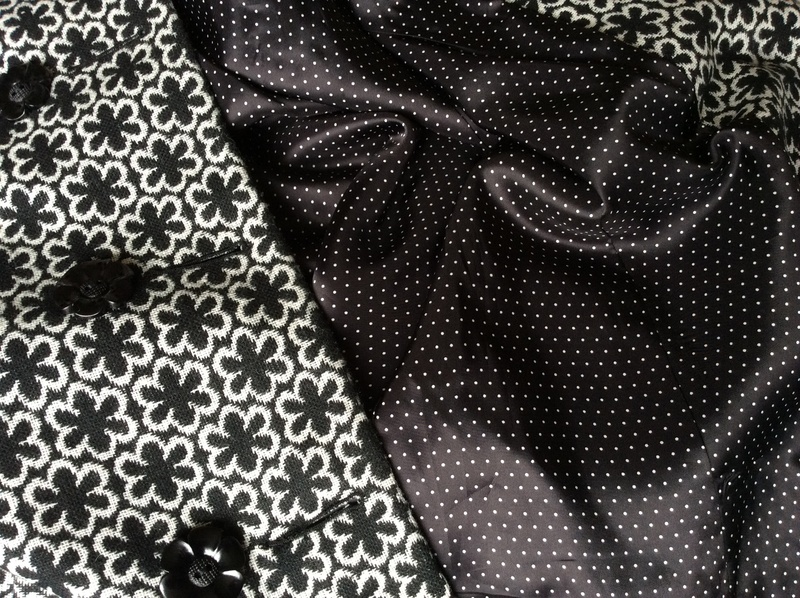 I am toying with the idea of making a little dress in the same fabric as the coat to wear together as a set – perhaps a sleeveless shift or a Megan – a la Jackie Onassis. What do you think? Would it be too much? Wow! That’s an amazing coat. I hope you are feeling proud as punch! Love the fabric, it’s beautiful! Well done, you should be really proud of yourself! What a lot of work! Hope you really enjoy wearing it. What an absolutely gorgeous coat! Hope your household are impressed even if they aren’t interest in the story of how it was made. Julie is fantastic!! Just had a class with her yesterday. It was so interesting to read what goes into making a coat!! and I’m so happy you’ve come out with such a beauty of a coat when you put in so much work! I absolutely looks made for you, such a nice fit. Love the buttons!!! and luckily it looks like its gonna be coat wearing weather for a good while! Thanks – what did you make yesterday? I love the studio – it is so girly! Yes, I am veering towards the Francoise but I think the raglans look a bit odd on the sleeveless version. Fabulous work and I LOVE the buttons. A short shift dress would work really well under this. SOOOOO jealous! One day ……..
You could easily do if – you are multi-talented! Great coat & it certainly doesn’t belong on the riverbank! Found you on Pinterest & noted the location – I can wave to you from the other side of the. Arun! Have started to sew again after 35 years (gulp!) commencing with a similar Clothkits pinafore for my granddaughter that I sewed for my daughter. 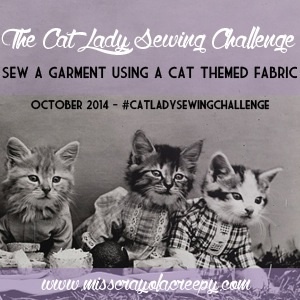 Great to find so many inspirational sewing blogs. Silvercloud is right. A plain dress but I think you should go for a colour that really suits you & what about a bright handbag? I am surprised you found me on Pinterest – I can barely find myself! Haven’t quite got the hang of it yet. Ooh, if you are local perhaps we could start a little sewing club! I do have a gorgeous red bag so I might try that out – thanks for the suggestion. Your coat looks fabulous! Hard work and time and concentration have certainly paid off! 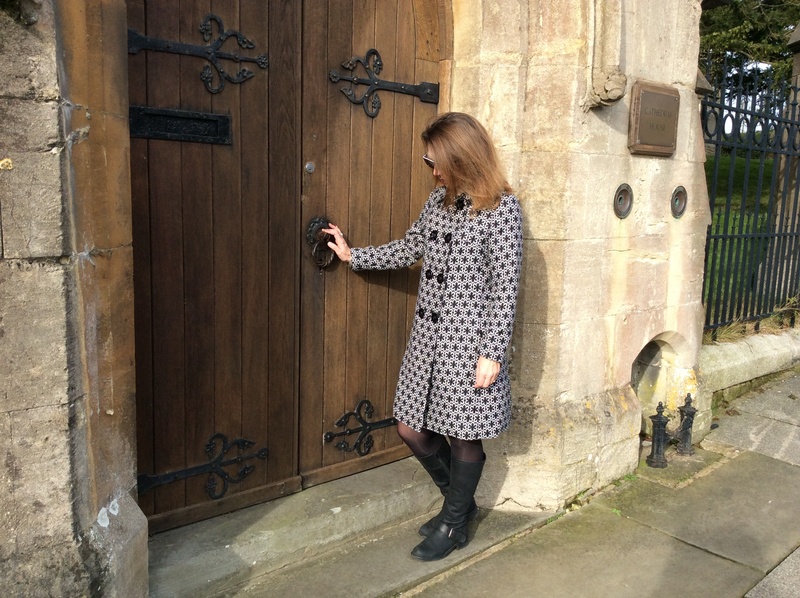 Such a great place for a photoshoot too the church looks great 🙂 only thing I would say about making dresses to match your jacket is will the jacket be weather appropriate when the weddings come around? A megan in that fabric will surely look the part though! 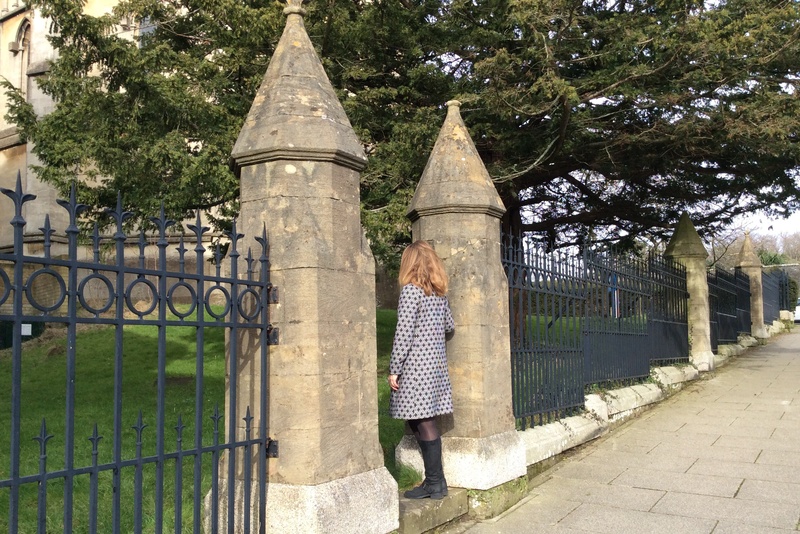 Hi, photos were taken outside Arundel Cathedral, St Nicholas Church and the castle. One of the weddings is in April – I must be the only person now hoping for the cold weather to continue! Absolutely love your coat! It looks professionally made and you must be very proud of yourself. Worth all the hours of angst and hard work. Really looking forward to seeing it on Wednesday at school! Thanks Liz – you next! Your coat is absolutely amazing – you must be feeling so proud! It’s such an achievement to make something so wearable! Thanks – I have surprised myself! 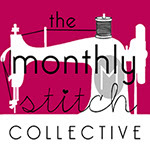 Guthrie and Ghani are running an overlocker course which incorporates making a Moneta – I am thinking about it! I like things which match too! A triumph, well done you. Our location reconnaissance paid off too. A happy end to half term week. Thank you for your artistic inspiration – we did a few at the Castle gateway as you suggested but the pictures were too dark. Wowsers!! Your coat is amazing! I also agree that a simple dress would look lovely with this. Thank you – I am on the hunt for a simple pattern. Love the coat. So beautifully made and wonderful choice of fabric and buttons. You have always had a good sense of fashion and this confirms it. How kind of you to say so but over generous I think! How funny to hook up after all these years via sewing blogs! WOW! It’s amazing!! It would be fab for a wedding with a little sleeveless shift dress. One day I hope I have the skill to make something as beautiful as this! Thank you! I think anyone could do it with the right hand-holding – I genuinely think that if I can anyone can. Wow, I am really envious, it is just perfect! You should be really proud of yourself! How about a little black Audrey Hepburn dress to wear underneath? I did think a black dress would look cool but I it is not considered acceptable for a wedding – the same goes for white which I also think would go! Shame no one in your household is interested because this is an amazing feat and you should be rightly proud of yourself! I’d say any solid colour (perhaps to echo the season?) dress under this wonderful coat would make a lovely wedding guest outfit. In all my years of sewing I have never been brave enough to attempt a coat or jacket, so well done you! Thank you! Sorry I meant no-one was interested in helping me with blog photos – the sewing is generally appreciated. Have a go – I have found it really rewarding but can only say that now it’s finished. Stunning….amazing job. So worth the money having lessons after seeing you coat. I’ve drooled over that fabric, it’s perfect for your coat. I’ve booked myself a sewing with silk class in June and am looking forward to making things that at the minute seem out of reach. Good luck with your class – silk is bound to need determination and patience! I think you could be right with the Francoise and I do have the pattern.